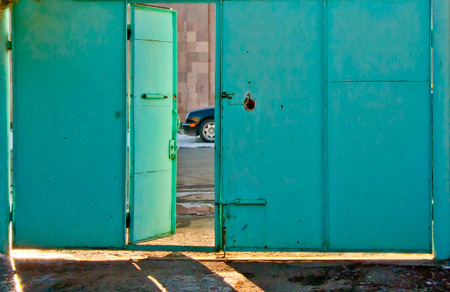 Out the turquoise doors we passed, our daughter leaving one home to join another. 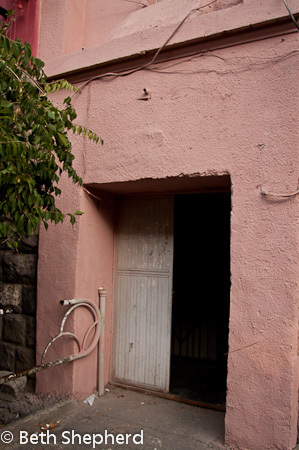 Walk through these doors in the other direction and you enter Baby Bird’s first world, a children’s home, where she lived for the first year of her life, surrounded by the voices of nannies and other children just like her, children who–for any number of reasons–were not able to live with their birth families. I will always be deeply grateful to the nannies who did their best to meet her needs. But to me, these walls also tell another story, one with limited opportunity, where there isn’t space to crawl and run and play, where there are no clothes or toys that were hers and hers alone. The children’s home was a place where even the most loving of nannies cannot meet the needs of a child in the way a family can. I can only imagine what might have been going through her head as two virtual strangers removed her from the only home she had ever known, from familiar faces, smells and sounds. I often think about what she left behind when–three years later–on most mornings, we clink our glasses together as a family and say ‘Genatz,‘ cheers in Armenian. I think about the women who cared for her, her language and culture. But then I think about the other children we saw, some whose faces I will never forget, many of whom will spend all their growing years inside the walls our daughter left behind in the arms of her new family. 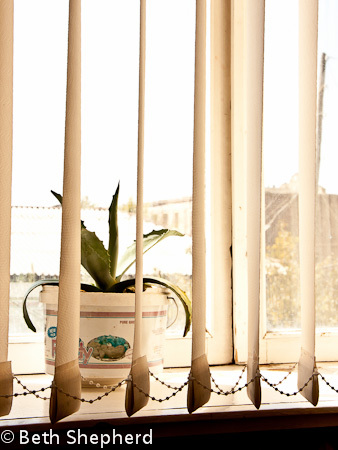 As we drove south, from Gyumri to Yerevan, Baby Bird looked out the window–eyes wide open–studying the new world surrounding her. Catch lights appeared in her eyes. Photographers love catch lights, which are created when a light source causes reflections in their subject’s eyes. They give the eyes depth, soul. If you look into my daughter’s eyes, you will see something beautiful, something that will always be inside her, that she will never leave behind. You will see the land where my daughter was born. You will see Armenia. Want to be in-the-know on all things Pampers? Follow me on Facebook, Twitter or RSS/email. 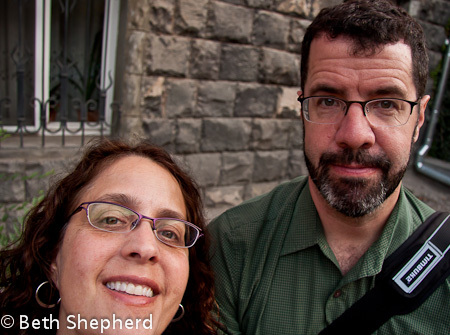 Two years ago in Armenia…we awoke in Yerevan and made ourselves a cup of Armenian coffee. Okay, we made several cups. 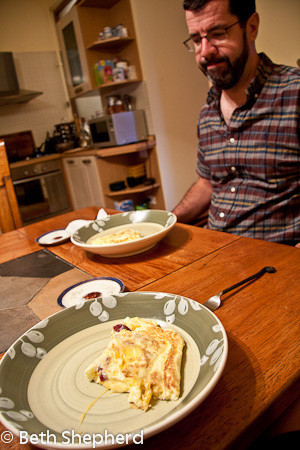 Next we had breakfast: Matsun (yogurt). I heart Matsun. Omelets (nice work Big Papa! 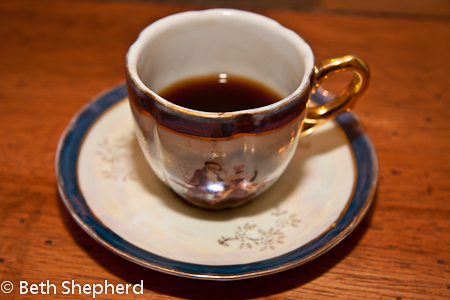 )…and more Armenian coffee. of course. Then we walked down the stairs of our apartment and waited for our taxi and translator. We don’t look nervous, do we? But we were! Our taxi took us to the Ministry of Justice, where we could see all of Yerevan and Mt. Ararat. There, we expressed our intent to meet and register a child for adoption. 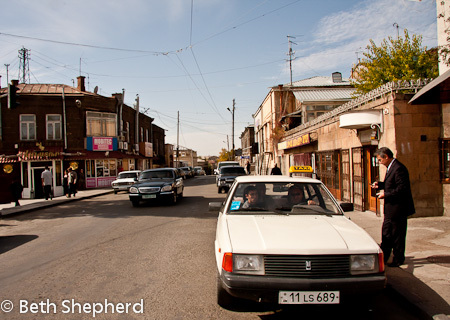 Next up was a taxi ride from Yerevan to Gyumri. It’s a long, desolate highway but I love the landscape, stark and lovely. Until our taxi got a flat tire. Not so lovely. But after the flat was fixed, we made our way towards Gyumri. There were one or two unplanned stops along the way. We drove through the city. Until we reached the blue gate at the orphanage, where you lived. We went inside and waited, and waited, and waited. and intently watching this door, because this is the door you would come through. Time passed slowly. At one point we got very excited, because one of the nannies brought in a baby. We jumped up, but it was the wrong baby! So we sat down and waited some more. We waited for nearly an hour. 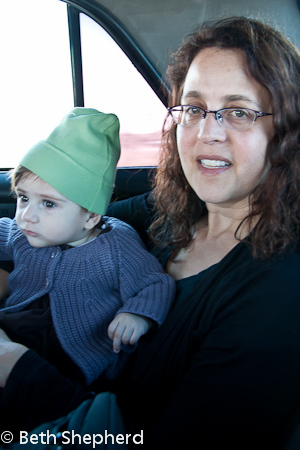 To Baby Bird and Armenia: both in my heart forever. 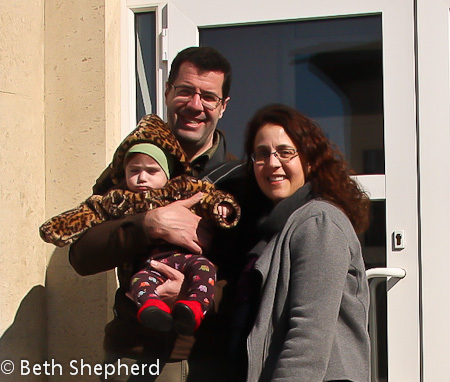 Two days after we became family in the eyes of the court, we went to take our daughter out of the orphanage. Other than a few weeks in the hospital as a newborn, this was the only home she’d ever had. The eight nannies who tended to her every need were the only “moms” she’d ever known. I’d thought about this moment for nearly four years. Sometime I’d get teary contemplating the enormity of it, but the perspective I always imagined was how I would feel when my baby was in my arms and we were embarking on our first steps as a family. I didn’t spend as much time thinking about the loss her caregivers would feel, and I now know I also underestimated the impact this transition would have on our child. 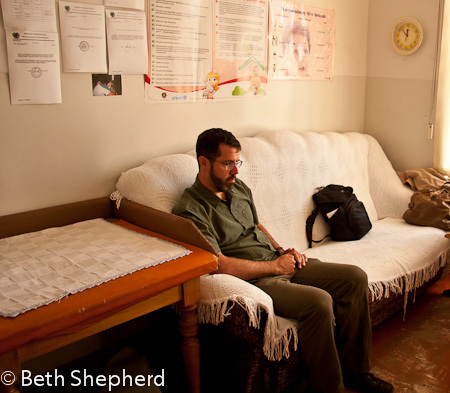 We sat, waiting expectantly, on a bench outside the orphanage director’s office, waiting for one of the nannies to bring our daughter to us. I was excited and sad at the same time. Excited because we were about to become a family, 24-7, and sad because we’d spent many hours in this building during our two trips to Gyumri, watching the nannies counting diapers in the doctor’s office, seeing the same smiling faces of the children laughing as they ran around the playground. 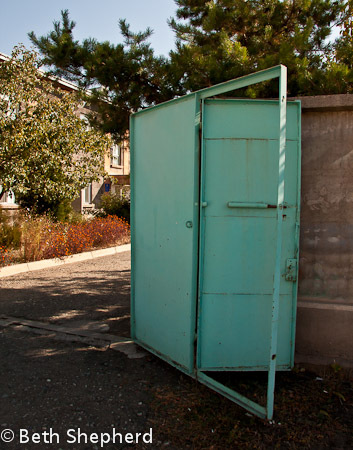 I knew that one day we would bring our daughter back to her homeland, to Gyumri, and to the orphanage where she’d lived, but I didn’t know when that day would be, or if the nannies or doctor who cared for her would still be working there. So this goodbye could be the last goodbye for all of us. I felt like we’d been sitting on that hard wood bench for a long time, when down the stairs came a nanny holding Baby Bird. She was dressed in the clothes we’d brought for her: a long-sleeved cotton onesie topped with a matching shirt and pants—brown with colorful elephants, a lavender cotton sweater over that, a green cotton cap on her head, a pair of red wool shoes on her feet and a fuzzy leopard print jacket with a hood. It was cold outside, but we knew that in Armenia children are always dressed in multiple layers, and we wanted her nannies to feel confident we’d take good care of her and keep her warm. As the nanny handed her to me, I noticed a pair of navy blue tights peeking out from under her pants. The tights were decorated with woven buttons. Tights! Of course, the one thing I’d forgotten to bring with us. I felt momentarily embarrassed and then secretly elated, because I’d seen those same tights on Baby Bird on a few of our visits and realized they would be the only belonging from her life here that she would ever have. There were—and always will be—unanswered questions about her days in the orphanage. Who were the children who fell asleep in the cribs beside our daughter? What are their stories and how did those stories end? How did the nannies soothe Baby Bird when she was frightened or woke up during the night? Which nanny did she like the best? 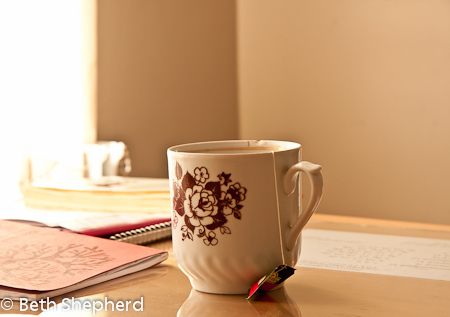 Were there memories, even visceral, that she would tuck away in the corners of her psyche? I had planned to tell our daughter’s nannies how much it meant to us that she was so well cared for. We left thank you cards for each of them with pictures of Seattle, and a photo of the three of us taken on our registration trip. But in the end, we weren’t able to say goodbye to them in person We were told there were important visitors at the orphanage so, after taking a photo with the director and signing our names in the book the orphanage keeps to record the names of adoptive parents, we were led out of the building. We took a few photos together, standing on the steps, and then we walked through the blue gate. I glanced over my shoulder. 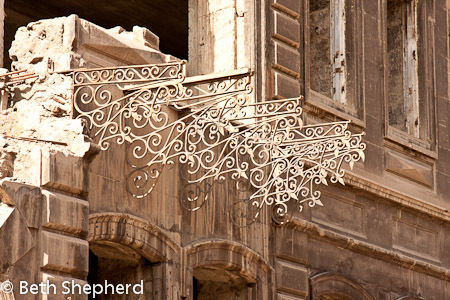 Sun streamed into the courtyard, and the crisp breeze whipped my hair. 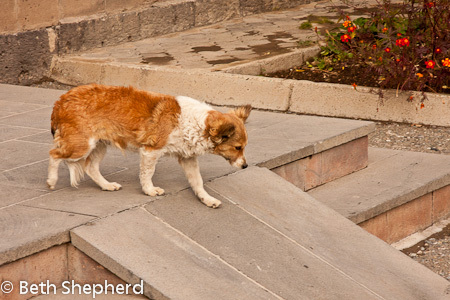 The greeter dog we’d seen every day during our visits lay on the steps leading up to the front door of the orphanage. Behind him were the buildings where our daughter spent the first eleven months of her life. Inside were the wonderful nannies who watched over her. I closed my eyes and silently said thank you. As our daughter grows, we will share their names with her in a book we’ve made about her adoption, and make sure she knows these eight women watched over her until we were able to be a family. Our driver was waiting beside the taxi. We crammed two suitcases in the trunk and strapped a third to the front passenger seat. Big Papa and I climbed into the backseat and looked at each other with that deer-in-the-headlights stare, because there in the back seat, nestled between the two of us, was a baby! Then we drove off, heading south towards Yerevan, on our maiden voyage as a family, and the first leg of the journey that, in two weeks time, would take us HOME! “You’re in good hands,” our agency’s attorney told as we climbed into the back of a black sedan idling in the airport parking lot. It was midnight, Yerevan time, and the moon was new which meant it was so dark outside that I wouldn’t have been able to make out the taxi if the headlights hadn’t been turned on. The hands being referred to belonged to our driver. He took our suitcases, and I sized him up: roughly six feet tall, probably 250 pounds, solidly built with a neck the size of a small tree trunk and hands as big as baseball gloves. No kidding, I thought to myself. I plopped myself in the back seat and Big Papa slid in beside me. I was shivering because it was cold outside. Really cold, like 7-below. We closed the door and our driver pulled onto the road. As the lights of Yerevan grew faint behind us, I wondered: do I feel more or less safe with a non-English speaking former Armenian wrestler driving on a remote highway in Armenia, with sub-zero temperatures outside our taxi? 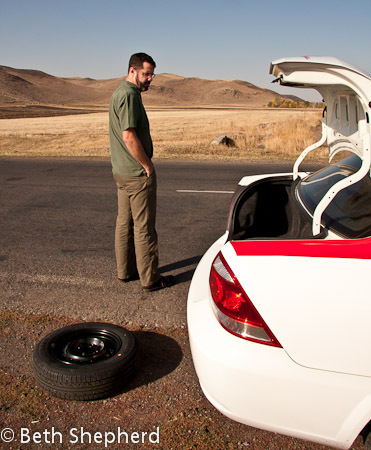 I recalled the week of hair-raising road trips we took during our trip to meet Baby Bird six months ago: we got a flat tire on day one, a speeding ticket on day two, and nearly ran out of gas on day three. On that trip, I stopped counting how many times our heads hit the roof of our taxi as we flew over bumps—without shocks—and I winced remembering the countless times our last driver used the center line as a lane. Our trip to register our daughter-to-be took place in October. On this trip, when we were scheduled to appear in court and finalize our adoption, it was March, visibility was poor because it was snowing and the roads were slick with ice. My nervousness ratcheted up a notch when I realized we were driving west, not north. We meandered slowly, up and down slippery hills, through tiny villages. At one point, we passed a petrol station and a pack of wild dogs ran angrily toward the taxi. They followed us, for a few hundred yards, growling and yelping. Where were we going? 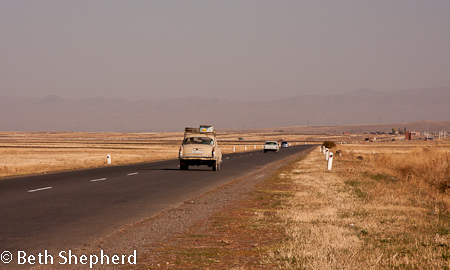 We’d been back and forth to Gyumri enough times to know this wasn’t the route we’d taken on previous trips. I felt scared and gripped Big Papa’s hand tightly. He gripped mine right back. 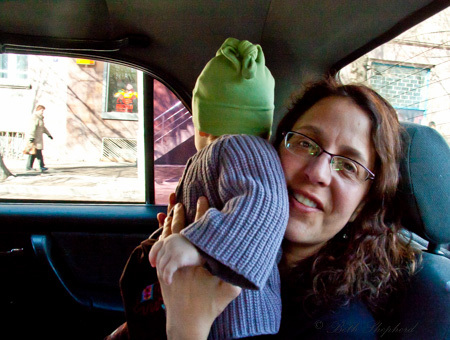 One taxi ride and 80 miles of wintry roads stood between us and the baby who was soon to become our daughter: one taxi ride, 80 miles, and our driver. Eventually we found ourselves traveling on a familiar highway, heading due north. I breathed a sigh of relief, even as car headlights continued to emerge, seemingly from out of nowhere as we made our way through the pitch-black night, snow falling furiously at first and then becoming lighter and lighter the farther we drove. A few fishtails every now and then kept our adrenalin flowing, but our driver was indeed a good driver and we arrived, intact, at the doorstep of the Nane Hotel. I looked at my watch. 2:20 a.m.
We checked in quickly and collapsed into bed, exhausted and exhilarated. Tomorrow we go to the orphanage and see Baby Bird for the first time in six months. She had been a five-month-old baby then; she was eleven-months-old now. I tried to imagine what she might look like—we hadn’t seen a single photo of her since our last visit. And then I fell asleep. Day three: on the road to Gyumri. We had a different translator than we had on days one and two. She was a quintessential Armenian beauty with dark brown hair blown-dry straight, large luminous brown eyes, always dressed to the nines, model-thin body. We’d had her translate for us before and on several occasions also experienced some interesting taxi conversations. I remember one ride that ended with some yelling, then a bit of disdainful laughing, followed by throwing money at the driver and, finally, slamming the door of the taxi shut. She told us the driver proposed to her during the ride. Our driver for day three was young, handsome, and a big smoker. Smoking is very common in Armenia and many of the cab drivers smoke. Usually our translator asked them not to, and since we were hiring them by the day, they usually comply (although I’m sure they light up the second we leave the taxi). I smelled cigarettes hanging in the air of the cab and my eyes began to sting after a few minutes in the cab. Our translator and the driver talked amiably. A beautiful girl and captive audience—I got the impression the drivers liked her as much as a full day’s wage. 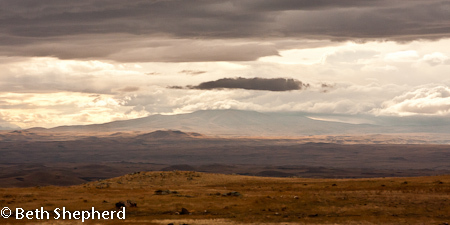 As we made our way to Gyumri, the sky was dark and ominous looking clouds loomed overhead. About an hour into the drive, I happened to notice that the gas meter hand appeared to be millimeters away from empty. The highway to Gyumri had several filling stations for the natural gas most of the taxis used, but the distance between one station and the next was many kilometers. The process of refueling was unlike anything I’d seen in the U.S. When we had to stop and refill the tank, we were asked to exit the cab and stand a safe distance away in a small way-station for this very purpose. Big Papa looked over the cab driver’s shoulder. “Um, hey…” I say tapping our translator on the shoulder. The words were barely out of my mouth when the taxi began to slow. Then it started sputtering. “No kidding” he replied with an edgy nervousness in his voice. Oddly enough, the driver didn’t seem the least bit concerned. Slower and slower, we inched along with the cab lurching and spitting. We rounded the bend, and there, like an oasis in the middle of a desert, was a gas station. Big Papa, our translator and I let out a collective sigh of relief. We pulled into the station and the three of us got out and waited at the station house while the driver filled up. I should add that by now it was raining like nobody’s business. Getting back into the cab, we didn’t talk much the rest of the way, but all I could think about was how lucky we were the gas station was there when we needed it. Maybe the driver knew the station was right around the corner or maybe he hedged his bets that he could make it, but all I know is we drove the last several hundred meters on fumes. When the blue gates of the children’s home finally came into view, I couldn’t have been happier. As per usual, the greeter dog was there to meet us. And I, for one, was over-the-moon to see him. 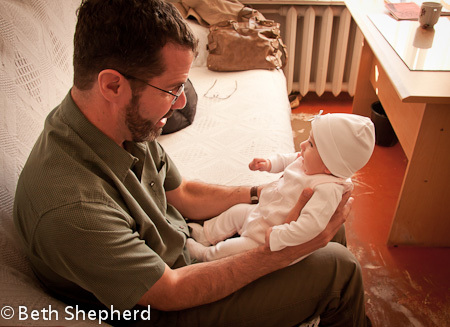 Big Papa and I made three more visits to the children’s home in Gyumri to visit Baby Bird. On day two, as our taxi pulled up to the apartment where we were staying, I paused, remembering the lack of shock absorbers…and the flat tire, from the day before. As soon as we climbed into the taxi, it was pretty obvious this particular driver was an extremely loquacious fellow. He started talking the second we pulled away from the curb. And he didn’t stop talking until we arrived in Gyumri, except once. That was when he got pulled over for speeding. I wish I’d been looking at the speedometer when the whirling red lights appeared in our rear view window, just to see the number. I can only imagine how fast we were going. Most of the taxis drivers drive well over the speed limit. Because of this, I was a bit surprised that the officer even bothered to pull us over. Our driver slowed. He was angry and a torrent of muttering erupted from his mouth. We pulled over to the side of the road, he rolled down his window and, for a moment, stopped talking. The police officer stepped up to the door of our taxi, and our driver got out and headed back towards the police car. I’m not sure what the protocol for traffic stops is in Armenia, but it’s definitely different from U.S. When the driver came back, he was grousing as he gave our translator an earful. She seemed more amused than anything else. I imagine she was thinking: what did you expect? The ticket fiasco added twenty minutes to our ride and, from what our translator told us, cost the driver about $40. He continued to grumble, and I’m sure he was pretty unhappy about the ticket, but I figured—given how fast we zipped along that highway—this was not his first time. I don’t think we were back on the road for more than a couple minutes before he lead-footed the pedal and off we sailed at lightning speed. Not even a ticket was going to slow this guy down. 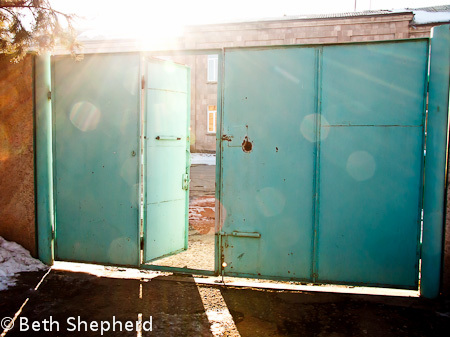 When we arrived in Gyumri, our driver headed straight for the children’s home, no directions needed. We flew around the corner, practically on two wheels, the taxi bobbing and popping over potholes. Thankfully this cab had better shocks than the taxi we took the day before. As we careened toward the gates at the children’s home, dust billowed out from underneath the tires. We stopped, suddenly, and I could feel my head lurch forward. Then the ride was over, and it was very, very quiet. The greeter dog raised his head from where he lay on the front steps of the children’s home, and trotted down the steps to meet us. I pictured him saying: Welcome back. It’s hard to describe the feelings that went through my head each day we spent time with Baby Bird. On the one hand, I wanted to drink in every moment, memorize the hue of her eyes, her scent and the sound of her cooing. But I was also well aware that she was not our child until we attended court, some five to six months down the road. And because we’d already had one adoption fail mere days before we were going to bring a baby home, I felt cautious with my heart and I know Big Papa felt the same way. I remembered all too well how slowly the months passed the last time we were in this place and how painful it was to raise my hopes up so high, only to have them fall to the greatest depths of sadness. Despite our apprehension, we enjoyed our time with Baby Bird immensely. 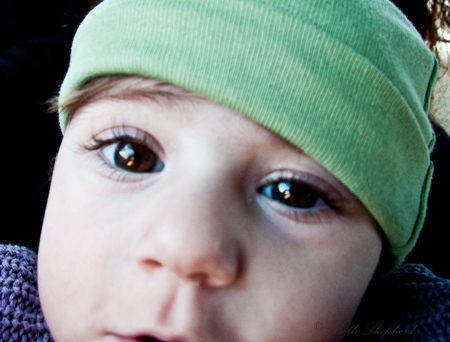 She was a very animated baby, eager to interact, make eye contact and imitate anyone around her. On several occasions one of us made a sound, and she replicated it to a “t.” We would say to each other “Did you see how she just…” When she did the same thing with our translator, who said the exact same thing we’d been saying, I thought to myself: This kiddo is on the ball. I loved her inquisitive nature: her fascination with the raindrops trailing down the window as well as the babushkas toddling along outside the window. I also admired her drive, like the way she gathered her strength and tried with all her might to sit upright on the couch, even as her tiny body listed port and starboard. My head told me: Shield your heart. But I could feel myself soften when I held her in my arms. 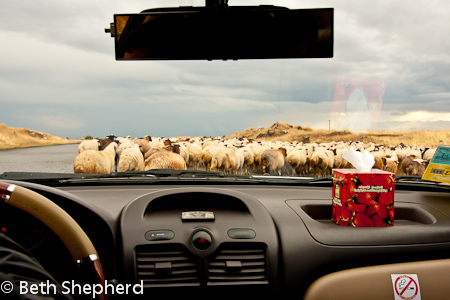 It didn’t take very long to realize there’s something about hurtling down a patched and bumpy highway in a taxi, at speeds exceeding 100 miles per hour, in the middle of rural Armenia, that lets you know you are really going somewhere. Because, in fact, we were. Side-by-side in the backseat of the cab, Big Papa and I were headed to meet the baby girl we hoped to adopt. A taxi ride doesn’t get much more potent than that. In Armenia, taxi cabs never have seat belts, so we carefully positioned ourselves as securely as we could, and toughed it out. Our translator sat in the front passenger seat. As she chatted amiably, in Armenian, with the driver, Big Papa and I looked out the window and watched the autumn scenery pass: 13,419 foot Mount Aragats loomed to the east, snow already coating its steep slopes, brown hills as far as the eyes could see, a smattering of trees with leaves turned shades of gold and rust, acres of wheat fields, crops spent for the season, the occasional sheep or cow herder waving a stick at his flock. Our driver appeared to be in his forties. He was slim and dark haired with an aquiline nose and a pleasant, unassuming face. I got the sense he’d been driving a taxi as long as he was old enough for his legs to reach the pedals. 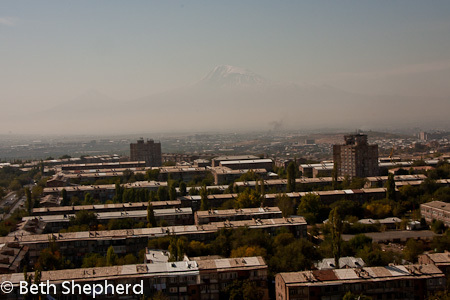 We sped along toward Gyumri as Yerevan rapidly disappeared behind us. 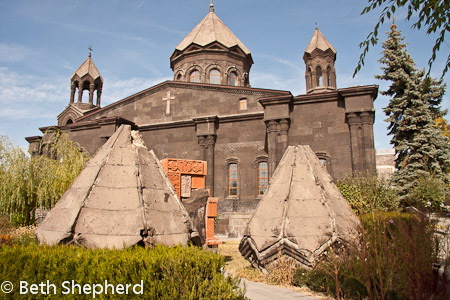 It was a two hour drive from Yerevan, the capitol of Armenia, to Gyumri in the north. As the crow flies, the distance is roughly 75 miles, but because of the twists and turns in the roads and the potholes—despite the speed we were traveling—we were told the journey would take us just under two hours. This particular cab had seen better days, much better days in fact, which was the case for most of the taxis in Armenia. Absence of seatbelts aside, our taxi on this fine October day was also lacking shocks. Each bump in the road sent our stomach to our throats, and we literally found ourselves airborne. Repeatedly. “Ow. Ow.” Big Papa moaned as his head made a loud thunk on the interior roof of the cab. I tried to stifle a laugh as I felt myself levitate a good six inches off my seat. It was like riding the mechanical bull at the county fare. My neck was already sore and we were only a half-hour out of the gate. Two adoptive moms, who had also received referrals from the same orphanage in Gyumri, had warned me about the condition of the roads. “Be thankful you’re not traveling in winter,” one of them wrote in an email shortly before our trip. For a moment I let my mind wander. Wouldn’t that take the prize? Our driver underestimates a turn a we find ourselves in a ditch. Fear fueled a burst of adrenaline in my body but I snapped into focus just in time to notice a high pitched whine coming from the rear of the car. In moments the sound of thwakety-thwak followed and the car veered to port. Our translator anxiously questioned the driver. The driver nervously looked right and then left before pulling the car off to the side of the road. Cars flew by us as he stepped out. “What’s going on?” I ask her. We both snicker as we turn our heads and see the driver shaking his. He opens the door and says something to our translator. “Flat tire. We need to get out of the taxi so he can change the tire,” she tells us. Great. Just great. I can feel a big cloud creep into my psyche as I mentally calculate the time we’re about to lose. We’ve already missed a day of visitation waiting to get permission from the Ministry of Justice Office and now, here we are, stuck roadside. “Does he have a spare?” I ask standing inches from the ditch by the road, gazing off across the fields towards the eastern hills. The sky is gray and threatens rain. Meanwhile Big Papa has maneuvered himself toward the back of the taxi, to help hold the trunk open as the driver assesses the spare, and makes his preparations to fix the flat. I imagine Big Papa’s dilemma: he doesn’t drive, he’s in a foreign country on a highway in the middle of no-where, he’s wondering what his role in this situation is and he’s fully aware of male dominated bias of the culture particularly where it applies to men and cars. “Don’t.” Big Papa admonishes, but I see the hint of a smile. Soon it’s apparent that our taxi driver knows exactly what he’s doing. Not more than fifteen minutes pass standing in this wind-swept valley before he nods, smiles, and then motions us back into the taxi, thanking Big Papa profusely as Big Papa sheepishly shakes his head. 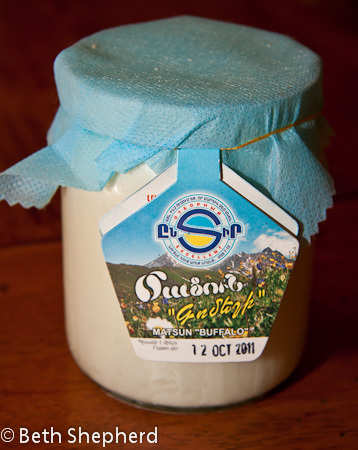 We continue on our way and another hour passes uneventfully before we reach the outskirts of Gyumri. I’m relieved. I’d rather be stuck here, near the orphanage, than sticking out my thumb trying to hitch a ride in the middle of the Shirak province. 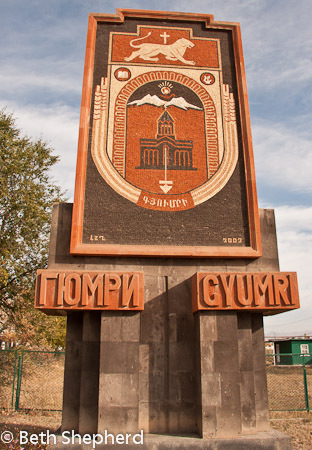 Gyumri, like the rest of the region, is still reeling—now 23 years later—following the devastating 1988 Spitak earthquake. 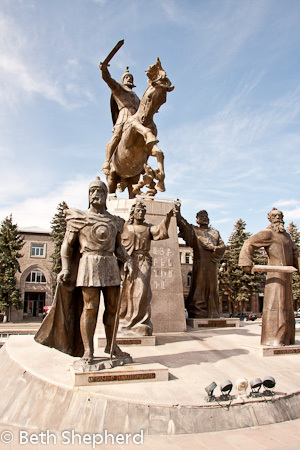 At least 25,000 people were killed in that disaster, and the ridiculously protracted reconstruction of the Shirak region translates into its people continuing to stumble in the aftermath. 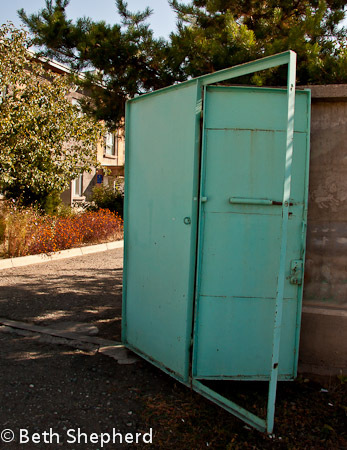 Because the earthquake destroyed the economy along with the cities, the poverty rate in the northern part of Armenia is higher than the national average, nearly fifty percent, making it the poorest region in the country. I’d read that people were still living in metal cattle cars, set up as temporary housing over two decades ago. Pulling into town, our driver is awestruck. 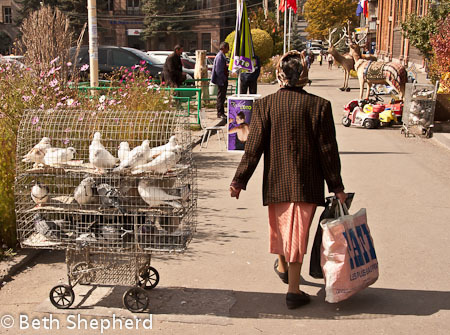 He hasn’t been to Gyumri in years, our translator tells us, and is surprised at how much improved the city looks. It becomes quickly obvious to us that it has indeed been many years since he’s been here as we pull over to ask first one, then two, and then several people directions to the orphanage. Even the police officer at stop number three has a blank look on his face when our translator tells him the name of the orphanage. As we weave our way through town I recognize the statue of the woman who stands at attention, with her arms in arabesque, we’ve passed by her two or three times as we’ve made our aimless circles. Finally we arrive at a corner the translator recognizes. Our driver gingerly edges our taxi over and around several crater-sized potholes, pulls over beside a stone wall with fading children’s paintings of mountains and people etched on its face like graffiti. There is an turquoise blue fence sandwiched in the middle. A scraggly tan and white dog , small with strikingly large ears, who appears to be a cross between a terrier and a corgi, saunters up to greet us. We’ve arrived.